Peaceful Pelican!! PRIVATE Balcony! NEW 1000 ft LIGHTED FISHING PIER! Peaceful Pelican is a bird watchers paradise! This newly remodeled 2 bedroom 2 bathroom condo located on the 3rd floor of Laguna Reef at Rockport. 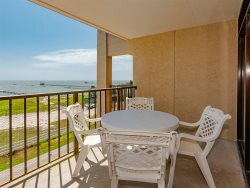 Enjoy the use of your very own private balcony and witness the amazing beauty of Rockport! Panoramic water views and the natural shoreline with a lagoon and an abundance of bird life from the balcony, master bedroom and the spacious living room. Make sure to bring your camera along so you can capture the many varieties of native birds right from the balcony. There is patio furniture available to you as a guest to use during your stay. And make sure to keep those curtains open on the large picture windows and patio doors. You will definitely enjoy that view from comfortable living room and watching the large flat screen smart tv. There are two bar stools at the bar for dining. You also have small desk that is a perfect space for your computer just in case you need to check in at work. The kitchen is fully stocked with all cookware and has brand new stainless steel appliances. There is also an icemaker, microwave and dishwasher and coffee maker. The kitchen has a bar that opens it up to the rest of this beautiful condo. You will be able to visit with friends or family while cooking or just enjoy the view. The master bedroom has a king size bed and closet for your vacation gear. This room also opens to the balcony! The second bedroom has two twin size beds and a chest of drawers for your use as a guest. Both bedrooms have large flat screen smart TVs. As a guest of Peaceful Pelican you will have access to the swimming pool, hot tub, 1000 ft. fishing pier with fishing lights, several shared charcoal grills, and the beautiful lagoon area at the water. There are also 3 large ice machines located on the first, second and third floors. There are also coin operated washers and dryers on the second and fourth floors in the same room as the ice machines.